Loosely based on Mu’min’s own upbringing as an African-American Muslim in Oakland, Jinn moves the action to Los Angeles, where Jade, a divorced weather anchor and spiritual seeker, thinks she’s finally found a home in Islam. At first, her daughter Summer is too preoccupied with her own problems—she’s got a school talent show coming up, and is on edge waiting for college acceptance letters—to pay much attention to Jade’s religious awakening. At the urging of her dad, who dismisses Islam as “a phase... your mother was a New Age Black Panther and a Buddhist when I met her,” Summer reluctantly begins attending Friday night services. At first, she’s doing it just to make her mom happy. 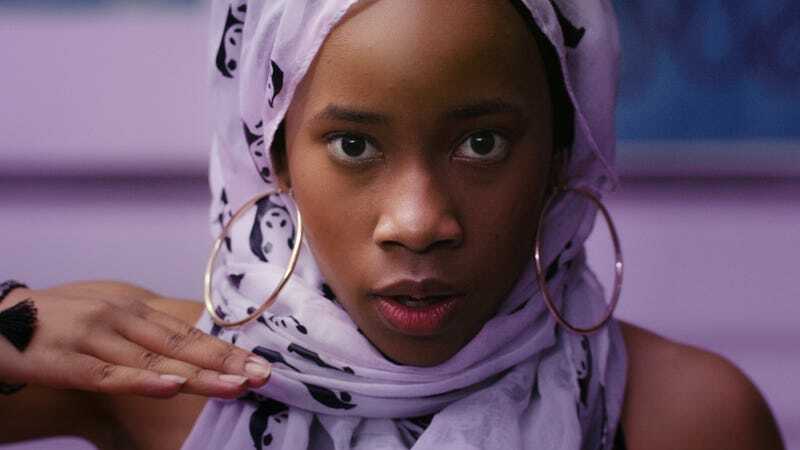 But ultimately, she converts as well, and strikes up a puppy-love romance with Tahir (It Comes At Night’s Kelvin Harrison Jr.), a classmate who attends the same mosque. But their journey is not all bean pie and family bonding. Summer and Jade’s relationship degrades as Jade’s views become increasingly dogmatic, especially after Summer posts a selfie in head scarf and sports bra with the hashtag #HalalHottie after dance practice one afternoon. 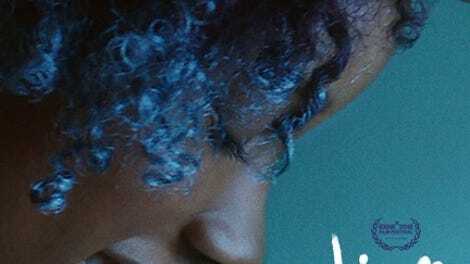 Although their relationship frames the story, the majority of Jinn focuses on Summer and her shifting identity, uncertainly mirrored by her ever-changing hair color throughout the film. “I feel like I have two bodies and one soul,” Renee says in voice-over, as Mu’min cuts between shots of Summer riding a skateboard in a football jersey and Summer in modest Muslim dress. This sense of existing between worlds is just one of the many obstacles faced by Muslims in an Islamophobic society—obstacles which Mu’min, who also wrote the script, introduces to the story in a commendably organic and nuanced way. Yet the specifics of Summer’s story are ultimately secondary to her universally relatable emotional arc. Anyone who has grappled with a parent’s attempts to push them into religion will identify with Summer’s confusion and wounded sense of betrayal, even as her attempts to negotiate head scarf etiquette and halal beef pepperoni are particular to her experience. Mu’min shows great sensitivity as a director, drawing a remarkably carefree and naturalistic performance from her young star that makes her sympathetic, even when her character is behaving in selfish and hurtful ways. The only downside to the film’s eventual curve inward is that it does leave some plot points underdeveloped, namely Jade’s fear of being fired for wearing a head scarf to work and Summer’s passion for dance. Jade’s embrace of fundamentalism also fades into the background as the film shifts its focus onto her daughter, which is unfortunate in a film otherwise in touch with the spiritual. The plot itself is textbook coming-of-age drama, driven by typical teenage concerns about popularity, parents, and blossoming sexuality. But perhaps that’s the point. This story may have been done before—with bigger budgets and bigger stars, even. But it hasn’t been done with a specifically African-American, Muslim, female point of view. And don’t those girls deserve to see themselves represented? To watch their own lives and dreams and anxieties rendered mythical on a 10-foot-tall movie screen? Equally importantly, it shows how much an artist like Mu’min can bring to otherwise well-trod material, and how valuable underrepresented points of view like hers really are.